You can choose delivery by download or DVD. Download it now. No shipping and handling charge! Download only! If you want a DVD, please order the DVD below instead. For Windows 10, Windows 8, and Windows 7. License code and download link will be emailed to you automatically when your order is complete. 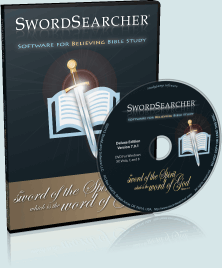 Full version of SwordSearcher Bible Software with the complete study library. Packaged DVD, just like it looks here! This DVD is super-easy to install. No internet connection required. 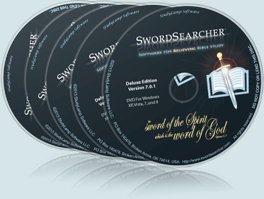 Five Deluxe Edition DVDs to be used by or donated to active Missionaries, Bible teachers, and Evangelists. A 50% savings (saves $149.88 on five). Discs only. Shipped without boxes. These discs are identical to the Deluxe Edition DVD above, except that they are not packed in a retail box. They include the complete Deluxe library. Delivery details: Download orders are fulfilled immediately by email. Physical product orders are normally shipped within one business day. In the United States orders are sent by USPS Priority Mail. Orders in other countries are sent by international Air Mail. 30-Day money-back guarantee: If, within 30 days, you decide you do not like SwordSearcher, you can uninstall SwordSearcher for a refund of your purchase price. If you ordered by download, you will be asked to sign a statement indicating that you have uninstalled the software and destroyed all copies of your serial number. If you ordered a physical product, you will need to return the DVD and packaging for a refund of your purchase price. Shipping charges are not refundable. SWORDSEARCHER.COM/STUDYLAMP SOFTWARE PRIVACY STATEMENT: Any personal information you communicate (including all contact information) will be kept private and not sold or given to third parties. The details you provide will only be used to process and fulfill your order. © StudyLamp Software LLC. All rights reserved.